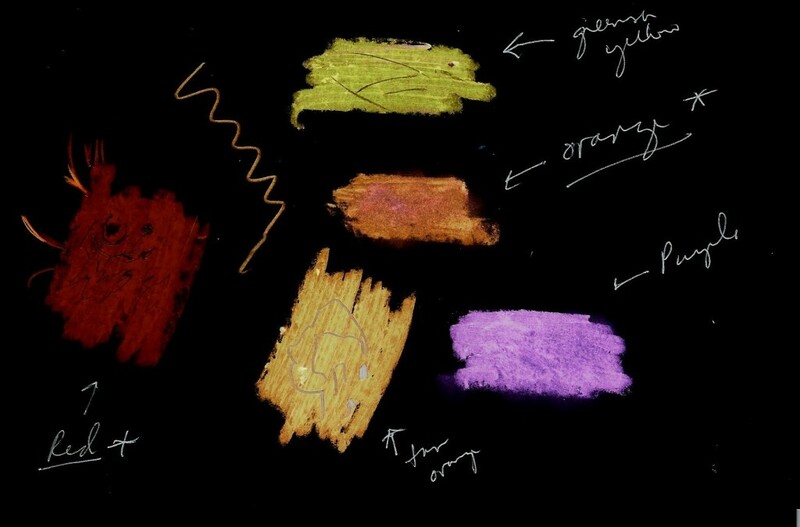 Non inverted colors on white paper. I was enjoying the Sun this morning and trying to decide how to represent the most prominent features. Sketching the Sun has just not gotten me the feeling that I can really represent it as well as I would like to as far as colorizing goes. I like using black paper but it isn’t smooth enough whereas plain white paper is. But when I have tried to add color later, it just loses what I see in the scope. So today I tried a little something different. I like how some inverted blue colors really become the right colors for the Sun. So I put some oil pastel colors to paper & inverted to see what I could use. 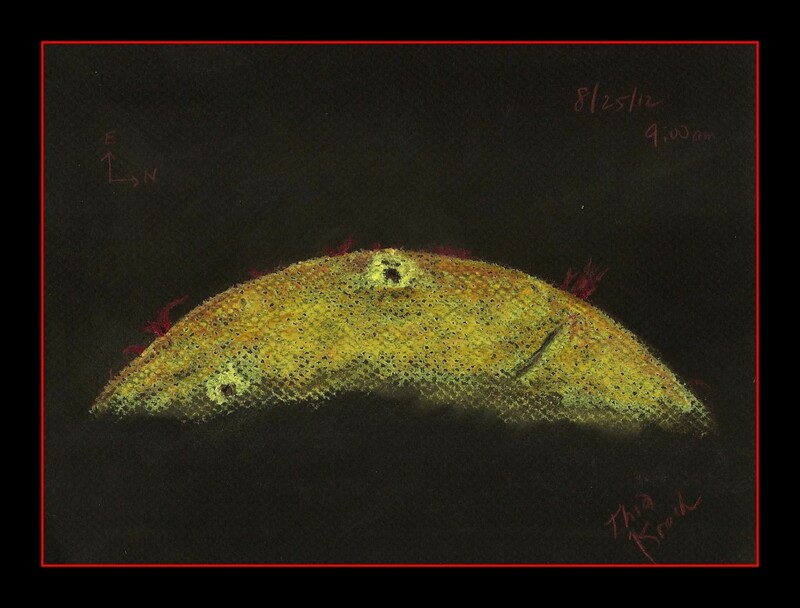 The nice thing about the oil pastel is I can scratch off small little lines to try to get the details of the solar surface. I had to think in negative to produce the sketch in order to preserve black, white and the different tones of red. This is my 1st attempt using this technique and I am not entirely happy with it but it is a bit of an experiment. Tonight I was hoping to glimpse the conjunction of the Moon with Jupiter. There was a lot of moisture in the air & as I often observe here in Hawaii when there is a lot of moisture in the air there was a lovely 22 degree Moon halo. Jupiter was a mere 2 degrees from the Moon & made a lovely sight. With the extra moisture in the air there was also a hint of red in the surrounding glow around the Moon. I sat down on the porch to sketch & when I looked up could not resist including Christmas lights under the eves that were in my view. Happy Holidays & clear skies all. 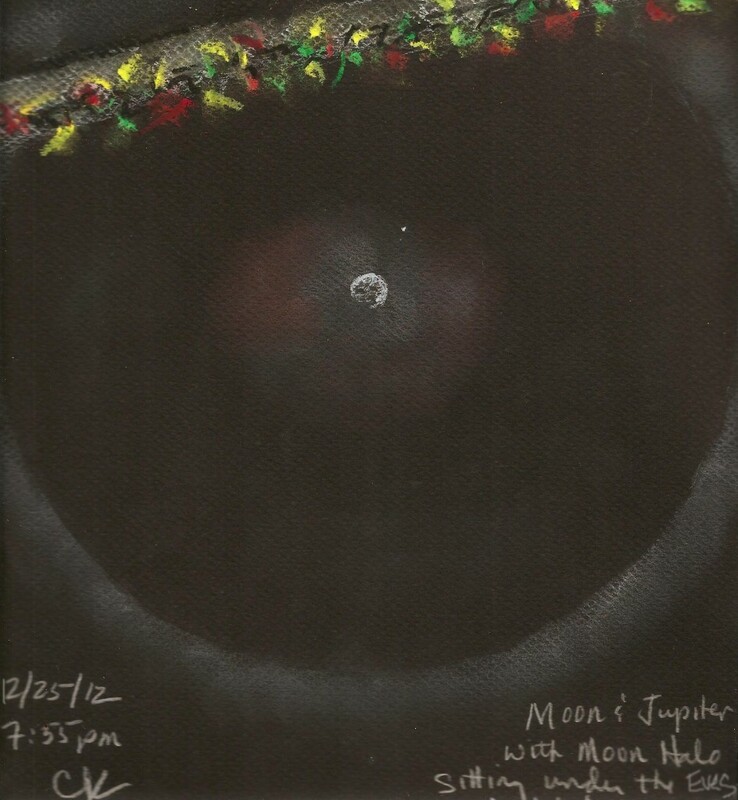 Something nagged me as I thought about Jupiter & the Moon last night after I submitted my sketch. I realized they were not 2* apart when I sketched them as they would have been at their closest conjunction. Earlier in the evening when the skies were cloudy is when they would have appeared to be closest. 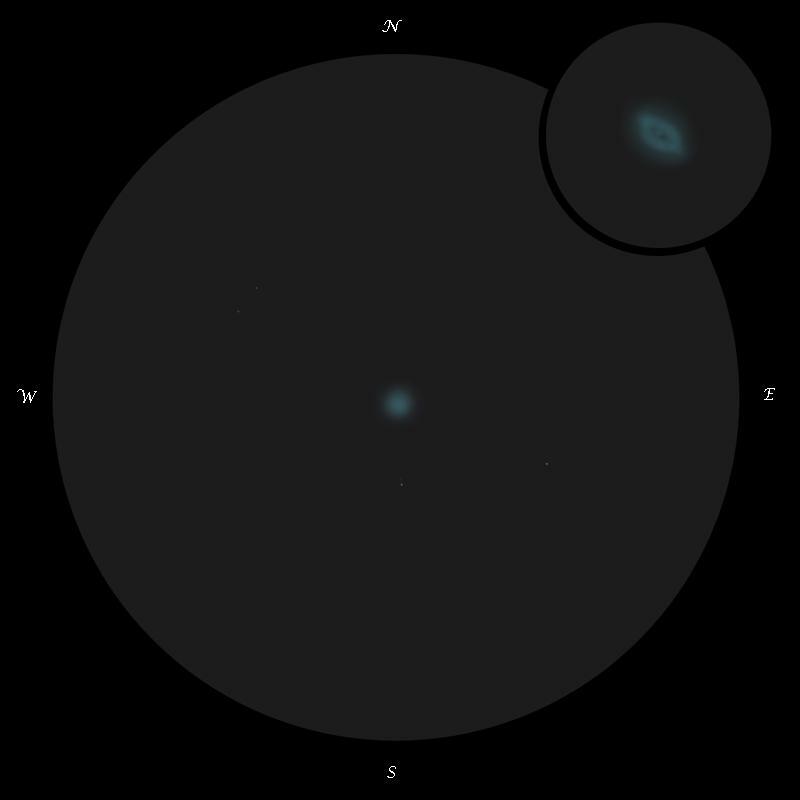 George Ogden Abell’s classic catalog of planetary nebulae contains 86 objects which are quite faint and challenging for avid deep sky observers. A good example of what to expect when tracking down these elusive nebulae is the ghostly Abell 72 seen here. Delphinus is a fair way north from my observing site, but the sky conditions on the night offered up some good transparency which assisted in observations. The western sky at twilight was just cloud free enough for one to see the planet Venus and the 1.23 day old moon together. I was about 12 hours away from catching a flight back to Chicago from Phoenix and I had just enough time for a quick free hand graphite sketch on copy paper before retiring for the night. 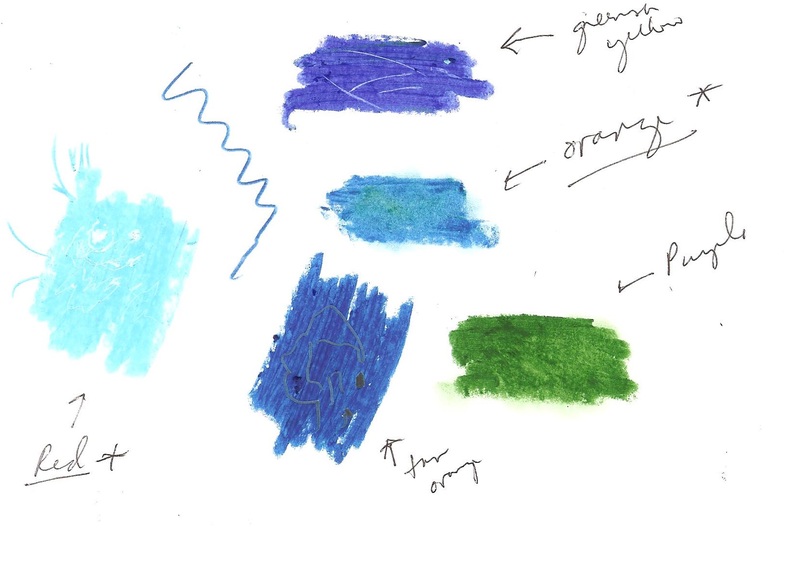 I included with the sketch notes on the sky colors and cloud locations so that I could make an oil pastel drawing when I arrived back in Illinois. 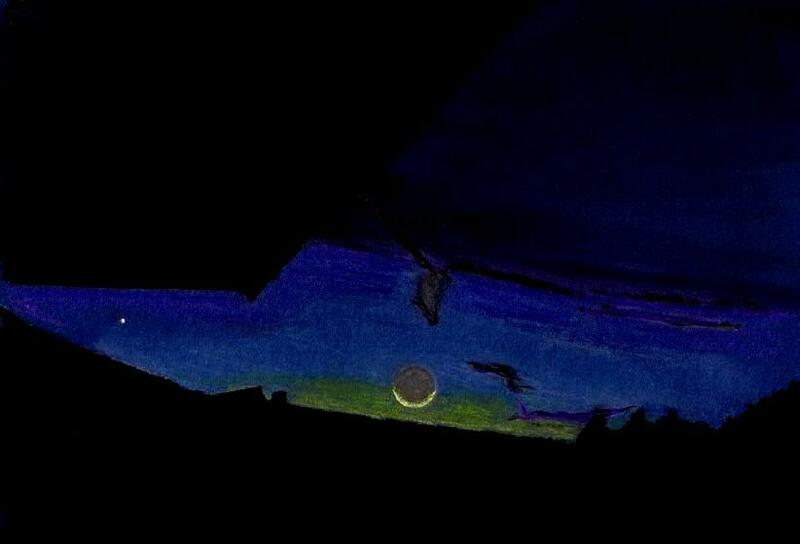 This is a re-drawn sketch in oil pastels of the Moon and Venus in the western sky on dark blue construction paper 12” x 14”. The original graphite sketch was completed in about 20 minutes on the back patio looking due west. No optical aid was used. The sky was partly cloudy and filled with aircraft contrails especially in the west. The air temperature was a pleasant 24° C (75° F). I just returned to the cloudy Midwest this afternoon from a brief trip to Mesa, Arizona. On the evening of October 19th the beautiful sunset had just occurred and the search for the young waxing crescent moon began in earnest. A quick turn to the eastern sky and the dark portion of the Belt of Venus could be seen 3° above the horizon. Looking back to the southwestern horizon I spotted the 1.8 day old, 3.8% illuminated moon in the golden green glow in that part of the sky at 6:08pm local time (1:08 UT October 20, 2009). 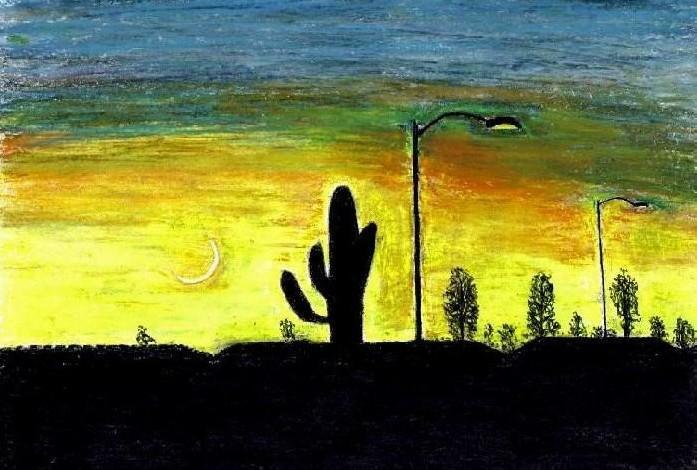 While the sun was setting, I began to sketch the scene using a piece of copy paper and a number 2 pencil. I took careful notes on the sky colors, positions of trees, cactus and roof tops of homes in Sunland Village East where I was sitting while I made this pencil sketch. After arriving back in Oak Forest, Illinois, I converted the pencil sketch and notes into an oil pastel drawing on to white sketching paper. I did not have access to a telescope at the time of this sketch but if I did I would have been looking at craters Neper, Gauss and Phillips the latter two along the lunar terminator and the former near the illuminated limb. 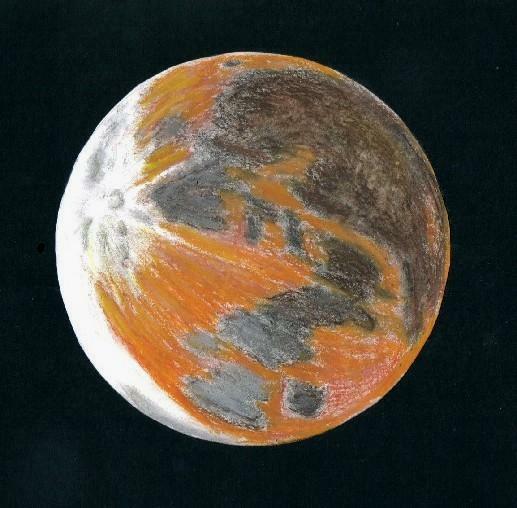 This is sketch of the Moon, first from long time. Wether in Poland is very bad in last couple of weeks. The Moon its passing low over Wrocław city. I like when it has a strong yellow color. Weather: Bad. Seeing: 1/5. Transparency: 1/5. Light Pollution. Clouds. 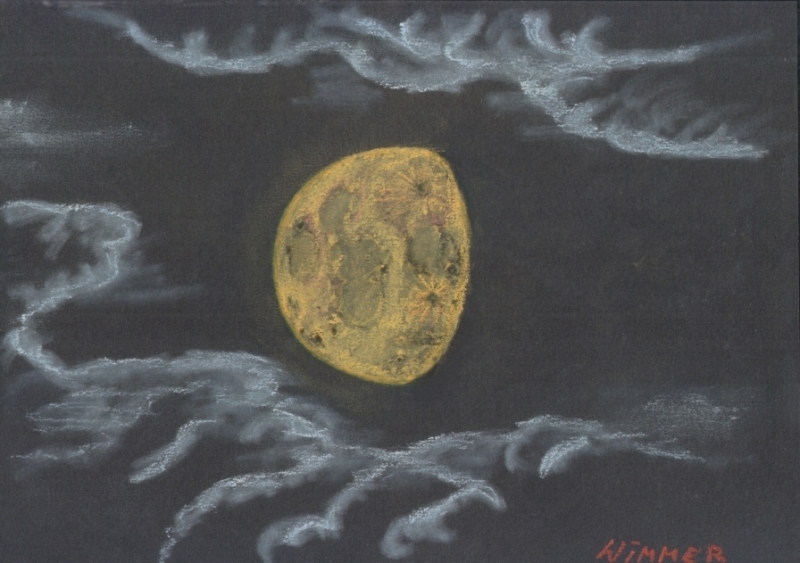 Technigue: Yellow pastels (oil & dry) on black paper. Over the past two evenings I sketched the view of our campus observatory dome and the waxing crescent moon with earthshine. On the first night beginning at sunset I drew the view of the observatory deck and dome from across the campus pond. The moon was already in the trees on this night so I knew I would need to return to capture the moon on the next evening if it was clear. 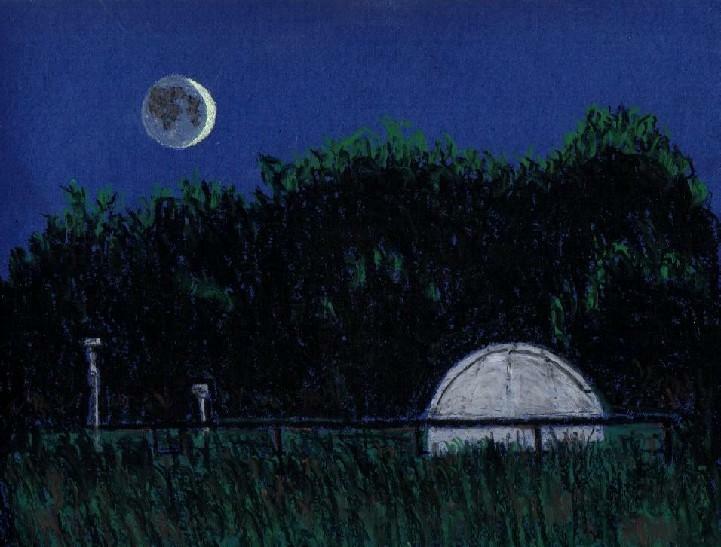 The white dome was brightly illuminated by the parking and tennis court lights. 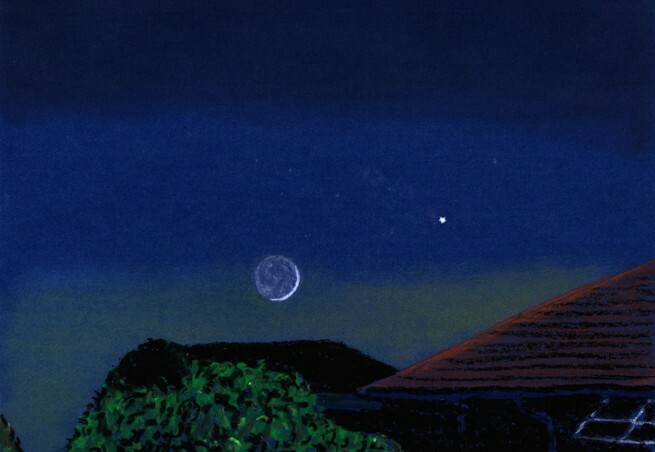 As luck would have it, the sky was beautifully clear the next evening and I was able to finish the drawing as planned. 9″x 12″ sheet of dark blue construction paper, a set of Grumbacher oil pastels, x-acto knife for correcting mistakes, flat edge toothpicks for blending, fly tying pocket clip-on lamp. 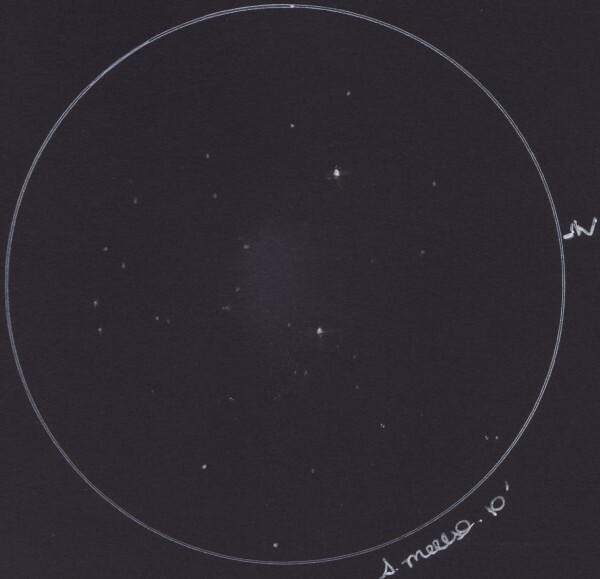 I made an observation of the Ghost of Jupiter (NGC 3242) in Hydra on February 19, 2009 (05:15 U.T.) using my 9-inch (23-cm) F/13.5 Maksutov-Cassegrain at 78x (inset image at 352x) under average to good seeing conditions (5-7/10). The Ghost of Jupiter lies approximately 1,400 light years from the Sun. This planetary nebula has a shape that reminds an observer of the planet Jupiter where it gets it’s nickname from. The Ghost of Jupiter exhibits a bluish color as noted. 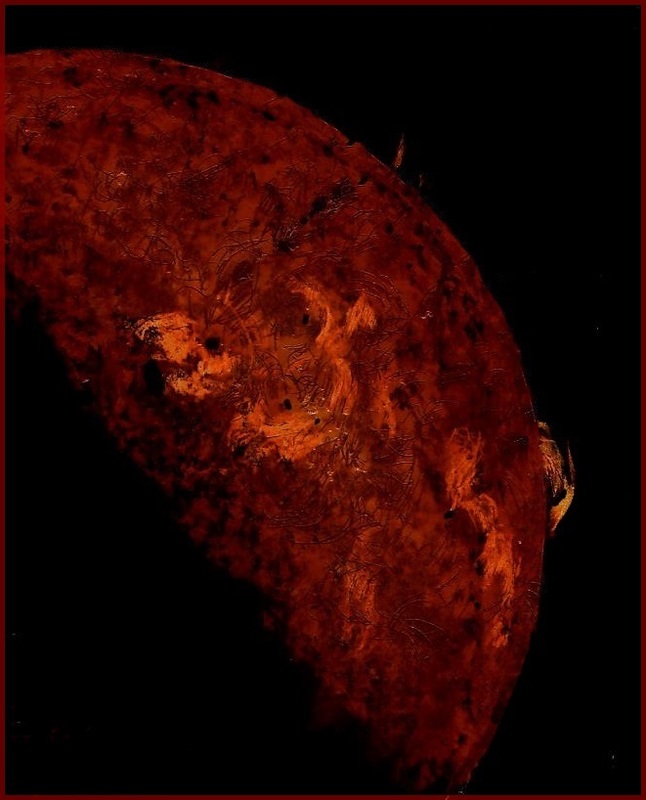 At higher magnification (352x) the inner shell of the nebula has an elliptical shape with a central “eye” and an outer diffuse shell. This is one of my favorite planetary nebulas to observe. On Saturday October 18, 2008 at 8:00 am local time, I was out walking in east Mesa, Arizona on a gorgeous morning with the air temperature about 22°C (72°F) and the humidity in the high teens. Over in the western sky the 19 day old waning gibbous moon was riding high and bright in a remarkable deep blue sky. Never in my life have I seen such a bright daytime moon. I stopped in front of a nearby building roof with a tall palm tree on the other side. I took out of the folder I was carrying an index card and using a pencil I drew the moon on one side and the building roof and palm tree on the other side. I jotted down some notes on colors and positions. When I got back home to Illinois, I combined the pencil drawings and notes into a mixed media sketch. 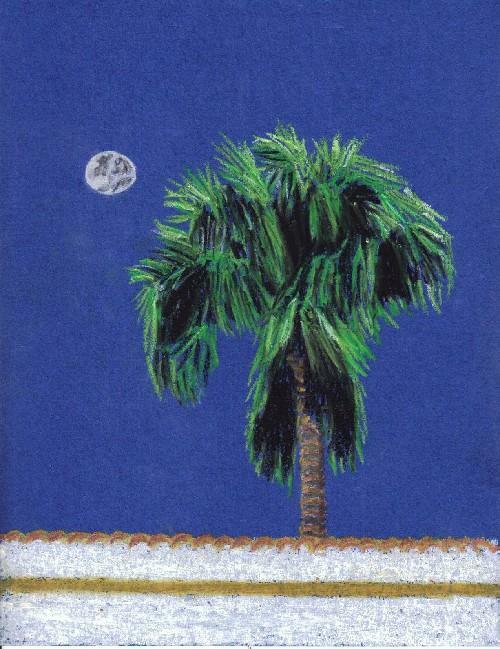 For the moon I used pastel pencils (white and black) and for the building and palm tree I used Cray-Pas oil pastels on deep blue construction paper. Of course the view was much better than I am capable of capturing but I will never forget the treat of this perfect morning. Location: Power Road and Broadway Ave. Mesa, Az. Moon at 19 days, high in the western sky. For this sketch I used: dark blue construction paper, 10”x 8”, white and black Conte’pastel pencils and a blending stump. Also cray-pas oil pastels for the building and tree. This sketch was put together from pencil sketches and notes made at the time of the observation. the Moon. I finished in time to see all of the earth’s shadow passage to totality. making this sketch, but I did feel a little rushed.